I recently enjoyed one of the two best books I’ve read this year: “In the Kingdom of the Ice –The Grand and Terrible Polar Voyage of the USS Jeannette” by Hampton Sides. It deals with the disastrous American expedition of 1878/81 – an attempt to reach the North Pole by sea after entering the Arctic via the Bering Strait. It was all but doomed from the start as the plan was based on a false premise. This was that the ice on the edge of the Arctic Ocean was only a narrow barrier, with open water beyond, and the premise was based on scant – and misinterpreted – evidence and wild supposition. The officers and crew of the USS Jeanette were to endure appalling hardships, and to display limitless courage in rescuing themselves – which not all were successful in doing. The Jeannette’s is an inspiring story of valour and resourcefulness, but also one of greed and callousness on the side of the ruthless press-baron who financed the undertaking as a publicity stunt. I had previously touched briefly on this epic in my blog of 26th September 2014 (it can be located via the side-bar to the right) but until I read Hampton Sides’ brilliant book I had not appreciated the full extent of the tragedy and the heroism. Touched on is the fact that as the Jeannette was setting out, it was known that a Swedish vessel, the Vega, was attempting the North-East Passage, and if she were to be successful might be emerging from the Bering Strait at around the same time that the Vega would be entering it. With my interest piqued I decided to find out more about the Vega’s voyage and what follows is a very brief summary of her achievement. 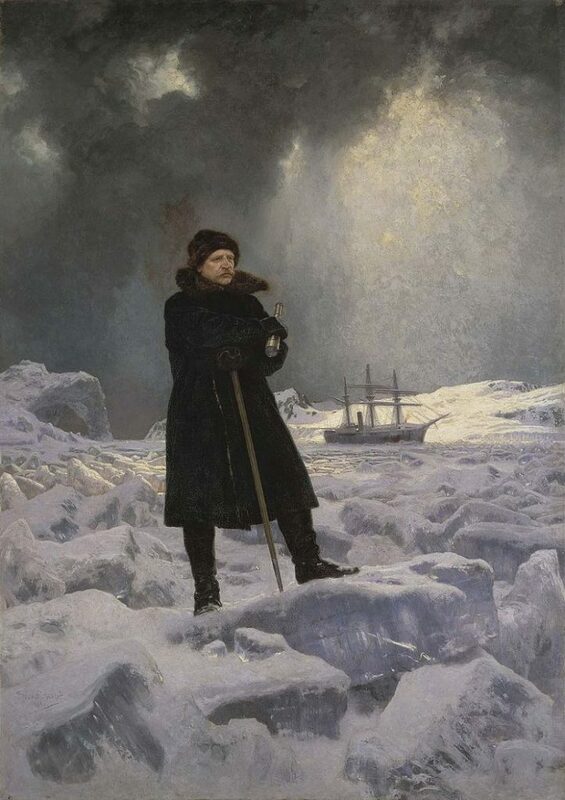 Finding the North-West Passage, across the north of Canada, that would allow the Orient to be reached from Europe by a shorter route than around the Cape of Good Hope or Cape Horn, was to be the focus of exploration – and tragedy – for some three centuries. The search was to involve spectacular hardship, failure and loss of life and it was only in the years 1903 to 1906 that Roald Amundsen, in a tiny fishing boat called the Gjøa, navigated the entire route for the first time. Though an epic achievement – which included getting locked in the ice for two years – it also demonstrated that the route was not practical for regular traffic. The North-West Passage’s counterpart was the North-East Passage, the route across the north of Europe and Asia, from Norway’s North Cape to the Bering Strait. From the sixteenth-century onwards British and Dutch ships had been trading with the White Sea in Northern Russia and had ventured as far east as the island of Nova Zembla – an amazing achievement considering the hazards involved. Further progress east was subsequently made eastwards, along the coast by Russian vessels, but winter ice always proved a block to a single continuous passage to the Bering Strait. The Russian achievement was however spectacular. The 17th Century saw the penetration of Russian explorers and settlers into Siberia, not only across the landmass, but along the northern coast bordering the Arctic Ocean and reaching the estuaries of the vast rivers Ob, Yenesei and Lena. 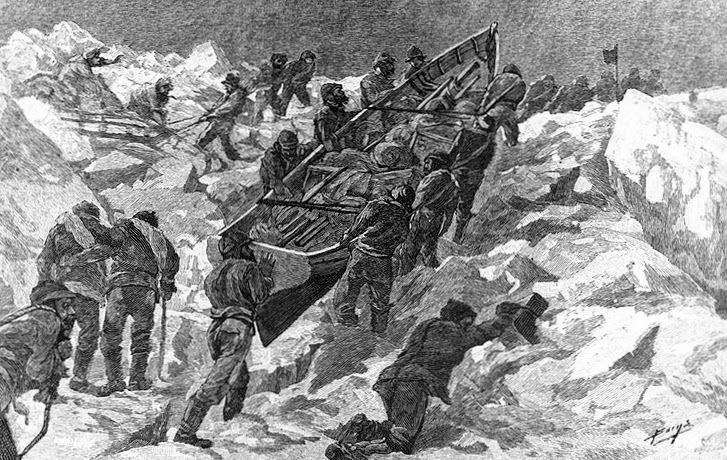 These efforts were facilitated by the use of “Koch” vessels – small sailing craft with reinforced skin-planking that were equipped to deal with ice. The greatest achievement of these years came in 1648 when a Russian explorer named Semyon Dezhnev descended the Kolyma river in north-eastern Siberia, reached the Arctic Ocean and travelled eastwards to emerge into the Northern Pacific through the Bering Strait. Of seven boats involved only two made it the whole way. (This expedition is largely forgotten outside Russia. (If any of my Russian blog-followers – of whom there are many – would like to contribute a guest blog on this I would be delighted to host it). 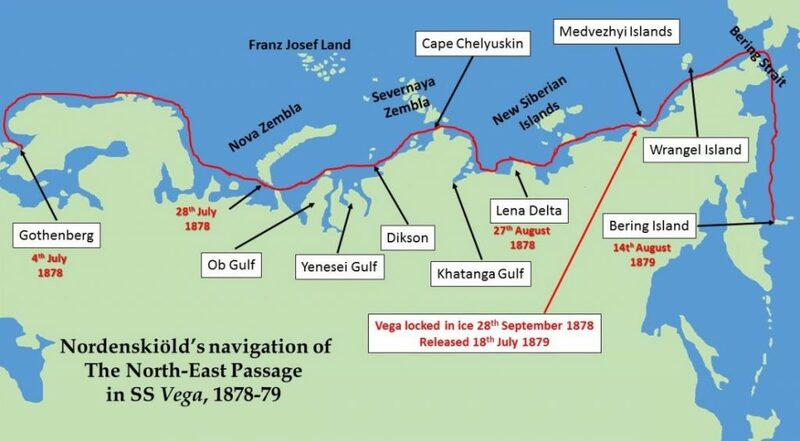 With Dezhnev’s heroic achievement left in obscurity, the credit for achieving the first North-East Passage has usually been attributed to Nils Adolf Erik Nordenskjold (1832 – 1901). First or not, Nordenskjold’s voyage was an epic in its own right, and a triumph of systematic planning and sound leadership. 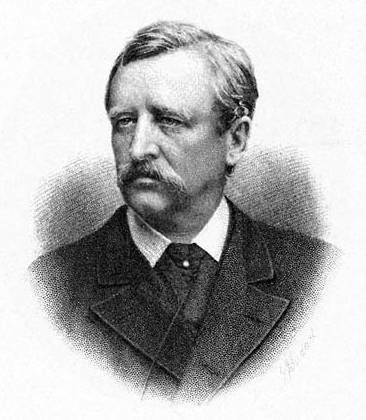 Born in Finland – which was at that time ruled by Russia – and from an aristocratic Swedish/Finnish family, Nordenskjold qualified as a geologist at the university of Helsinki and after graduation in 1853 undertook a mineralogical study in the Urals. Russian rule was resented by the Finns and Nordenskjold, outspoken on the subject, drew such unwelcome attention from the authorities that he moved to Sweden in 1857, establishing himself as curator of mineralogy at the Swedish Museum of Natural History. By now interested in the Arctic, he participated in an unsuccessful 1861 expedition which attempted to reach the North Pole by means of dog-sledges from the north coast of Spitzbergen. He returned to the Arctic several times in the following years and in 1868 reached the highest northern latitude yet attained in the eastern hemisphere. This was followed by an expedition to Greenland in 1870 and a return thereafter to Spitzbergen. 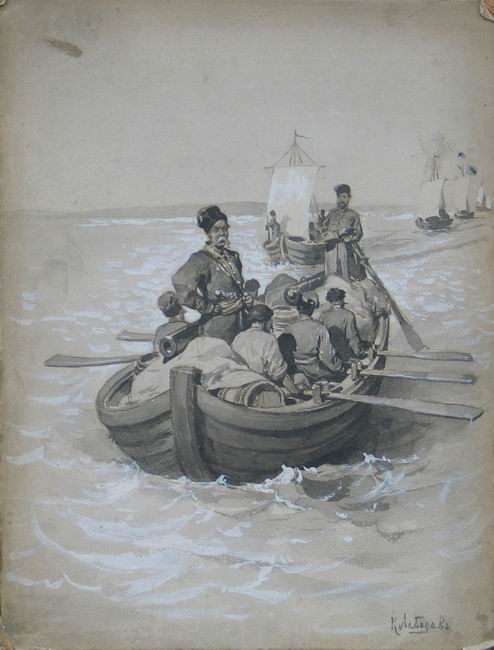 In a series of voyages, he once more achieved a “furthest north” record and in 1875 he pushed as far eastwards as the mouth of the Yenisei, one of the three great rivers that flow north from Siberia into the Arctic Ocean. These expeditions established him as the most experienced Arctic explorer of his day and he was now convinced that – with correct timing to take account of summer ice-melting – it would be possible to complete the North-East Passage. He gained a powerful patron for this scheme, King Oscar II of Sweden. With Oscar II’s support, a subscription was raised to fund the expedition. A ship was purchased, the Vega, of 300 tons, formerly used in walrus-hunting in northern waters, and she was further strengthened to withstand ice. She left Sweden in early July 1878, carrying supplies for thirty people for two years. An especially impressive achievement was that fresh bread was to be baked during the whole expedition that followed. Progress now became steadily more difficult as the Vega pushed on. Thick fog made navigation through increasing numbers of ice-floes both difficult and dangerous. Notwithstanding this, the Vega reached the mouth of the Lena 27th August. From this point conditions improved and fast progress was made through an ice-free sea and hopes began to rise of completing the passage before the full onset of winter. This soon proved over-optimistic. Snow fell from September 1st and fog again descended. Ice was pushing down from the north and progress was only possible by hugging a narrow ice-free channel near the coast. Contact was however made with Chukchi, an indigenous people of North-Eastern Siberia. These were the first people the Vega’s crew has seen for six weeks and they were dressed in reindeer skins with tight-fitting trousers of seal-skin, shoes of reindeer-skin with seal-skin boots and walrus-skin soles. In very cold weather they wore hoods of wolf fur with the head of the wolf at the back. The mention of “American whalers” was significant since it indicated that some vessels at least had reached that point from the east, and that open water must exist for some part at least of the year. Nordenskjold therefore pressed on through snow and ice and fog in the hope of getting through to the Pacific before the sea was completely frozen over. But the ice was beginning to close. Large blocks were constantly hurled against the Vega, threatening her destruction. On 28th September, the struggle eastwards ended and the Vega was frozen inextricably into the ice. Nordenskjold estimated that this was only 120 miles distant from the Bering Strait, a fact all the more galling as 2400 miles had already been covered since leaving Sweden. Nordenskjold’s meticulous planning stood the Vega and her crew in good stead for the coming winter months and food was not going to be a problem. Locked as she was in the ice, the vessel was close to a settlement of Chukchi. These hospitable people helped the crew to enliven the winter with short expeditions in land on dog-sledges when weather permitted. The trapped ship was enshrouded by snow and it was reported to penetrate every nook and cranny where the wind could find an opening. Morale remained high however and Christmas was celebrated in the traditional Swedish manner. 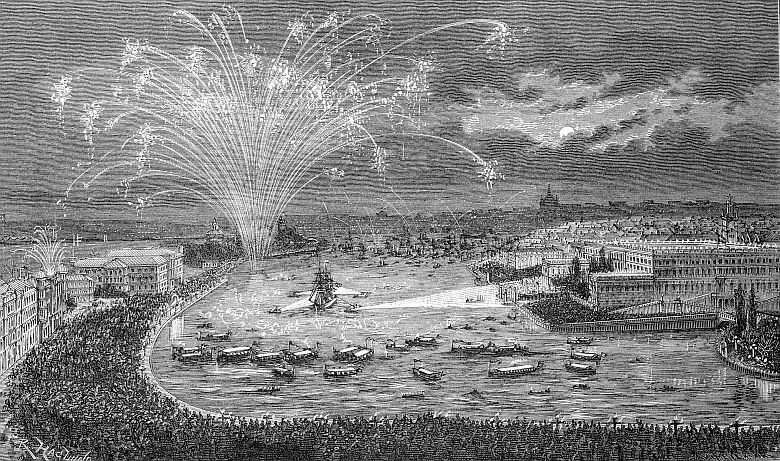 Vega’s welcome back in Stockholm, 24th April 1880. What followed was almost an anti-climax compared with what had gone before, a triumphal progress home that included Nordenskjold’s reception by the Emperor of Japan – who presented him with a medal. On 24th April 1880 the weather-beaten Vega, accompanied by flag-decked flotillas of admirers, sailed into Stockholm and an ecstatic welcome, led by Oscar II, who ennobled Nordenskjold as a baron. 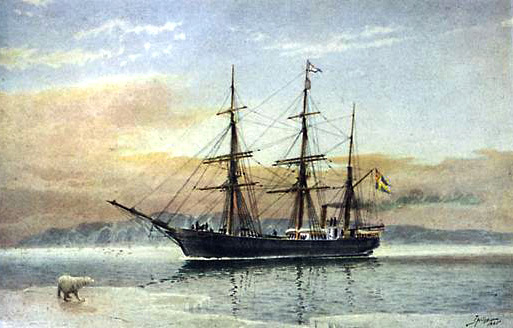 Nordenskjold was to make one more Arctic expedition, in 1882-83, this time to Greenland, and again in the Vega. Thereafter his career was academic and in 1901 he was nominated to receive the first Nobel Prize for Physics though he died before the award. Relatively little-remembered today, he must count as one of the greatest of all Polar explorers, the meticulous nature of his planning and his strict scientific approach ensuring success.